Figure 1:Comparison of the EMCCD with the conventional CCD for low light levels. Even the weakest spectral features can be observed with the application of EM gain which would otherwise remain obscured in the background noise of the conventional CCD. 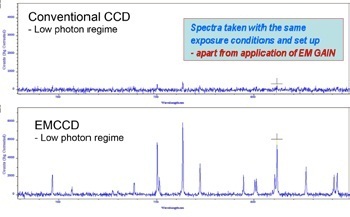 Both spectra taken under the same conditions apart from the application of gain. Data captured for a Newton DU971N-BV camera on a Shamrock 500i spectrograph using single scans with Full Vertical Binning (FVB). Electron Multiplication (EM) technology has been one of the most important developments in light detection over the last decade. It has revolutionized the whole area of low-light Spectroscopy and imaging, enabling research that hitherto would not have been possible. EM on the CCD chip allows for the amplification of the captured electron signal before it is ever read out through the camera electronics resulting in reduction of the effective readout noise to sub-electron levels. Sensors implementing EM amplification offer ultra-sensitive detection down to the single photon level. The first and most powerful EMCCD camera for Spectroscopy – the NewtonEM – was introduced by Andor in 2005. Other Andor cameras which implement EM sensors are the iXon3 and LucaEM families which are used primarily for imaging applications though some are being used for Spectroscopy particularly where fastspectral rates are a prime requirement. The NewtonEM has the added versatility and flexibility of being usable as both a conventional CCD and as an EMCCD; it is effectively ‘two-cameras-in-one’ with one simple click in the software to switch between them. EM technology comes into its own when operating in a low-light regime (typically <100 photon per pixel), where the added sensitivity offers obvious benefits. Such scenarios may arise when dealing with an intrinsically weak signal, when fast spectral rates are required with minimal exposure times, or in situations where the excitation energy has to be kept low to avoid damage to the sample under investigation. Figure 1 illustrates a comparison of a conventional CCD with an EMCCD where the spectral intensity has been deliberately delivered in a low photon regime with the use of neutral density filters. The experimental conditions were exactly the same apart from the application of EM gain. Increasing the gain pulls the spectral features out of the noise to be clearly visible (figure 1. bottom), features that would otherwise have remained buried in the noise floor of the conventional system (figure 1. top). Figure 2:Signal amplification by electron impact ionization – EM gain. Schematic shows charge being clocked through the EM register and being amplified in the process. EM technology is implemented on the CCD sensor with the inclusion of a special readout register which takes the rows of pixel charge packets from the active area of the sensor and delivers them to the readout node electronics, whilst in the process causing the charge packets to be amplified i.e. the numbers of signal electrons is multiplied. The readout node consists of the pre-amplifier (Pre-Amp) and analogto- digital (A/D) electronics which converts the analog signal to the digital representation in ‘counts’. This digitized signal can then be sent to the computer for analysis. It is this readout node which gives rise to one of the most important sources of noise in the overall system – the readout noise (NRN) – and in the highest performance detection systems often determines the ultimate detection limit or sensitivity of the camera. It is the effective overcoming of this readout noise where EM gain delivers its benefit. The basic principle of EM technology is illustrated in figure 2. 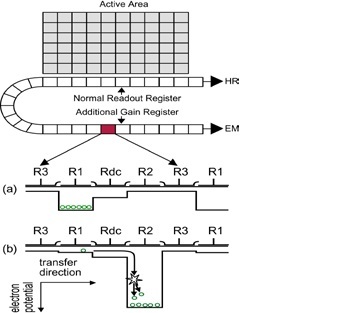 The sensor has two readout registers, a normal or conventional register and the EM register. The clocking voltages used on the EM register are higher than for conventional clocking. These higher voltages cause the electrons to acquire sufficient energy such that extra electrons are released by a process know as impact ionization; the increased charge package is stored in the next pixel along the chain. There is a small probability of this process actually creating additional electrons within the packet but with multiple elements or stages within the readout register significant overall gains are possible. Gains in the number of electrons up to factors of x1000 are possible – hence the term Electron Multiplication (EM). 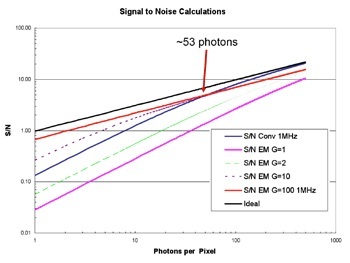 Figure 3: Signal to Noise ratios (SNR) for the EM and conventional CCDs operating in the low photon regime. SNR ratios here are based on a NewtonEM (DU970N) EMCCD operating at 1 MHz readout rate. The conventional, ideal and curves for several values of gain are included. This reduces to the basic SNR equation for the conventional sensor with the gain G=1 and the noise factor F=1. Figure 3 shows SNR curves for the NewtonEM with low photon signals. The ideal curve corresponds to the ultimate noise limit of the signal shot noise. Several curves for different gains are included which show that increasing the gain is beneficial for the lower photon signals. The characteristic for the conventional CCD crosses over that of the EMCCD – with gain x 100 - at a signal of ~53 photons per pixel. This means that weaker signals below this transition point will benefit from EM gain, whereas for stronger signals above this level there is a better SNR with the conventional system. When the systems are operated at the fastest readout speed of 3 MHz, the readout noise is greater and the benefits of EM gain would be seen for even stronger photon signals up to just under 100 photons/pixel. It will be noted that as the photon signal increases, the SNR ratio for the conventional CCD approaches that of the ideal curve i.e. the noise becomes limited by the intrinsic shot noise of the signal. However, in the case of the EMCCD the SNR ratio approaches the ideal but will always have a systematic offset towards lower SNR; this offset is associated with the noise factor (F) of the gain register. When operated with very high gain and signals with ultra-low levels, an EMCCD can be used in ‘photon counting mode’. This is a special mode of detection where the camera can count single photon events and build up a spectrum over time based on the discrete counting of these events. It is this ultra-high sensitivity and extremely fast spectral readout rates, along with a full featured, versatile and easy-to-use configuration platform that make the NewtonEM the ideal choice for the most challenging Spectroscopy applications.